Field Woundwort is not easily confused with other wild plants on this web site. 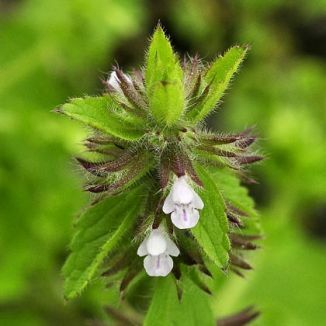 Growing on arable, sandy and disturbed ground, Field Woundwort is a hairy little annual plant which grows to about 40cm tall. It straggles through cultivated land mostly and, unlike its relatives - Marsh and Hedge Woundwort - it is not a native plant. It bears very pale pink 2-lipped flowers (12-20mm long), which have faint purple markings on the flat 3-lobed lower lip. Borne in leafy spikes, the flowers are held in whorls, each flower emerging from a 5-toothed, extremely hairy calyx. The hairy, short-stalked leaves are heart-shaped with blunt teeth. 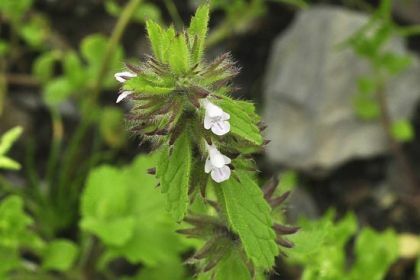 Field Woundwort blooms from April to October and it belongs to the Lamiaceae family. I found this wildflower – just like the books say – in a cultivated, sandy field in Dohilla which is on Valentia Island, Co Kerry, in 2009. I photographed it then. In herbal medicine, Woundwort has been prepared as a tea for sore throats and fevers. It was also recommended for use as an eyewash.